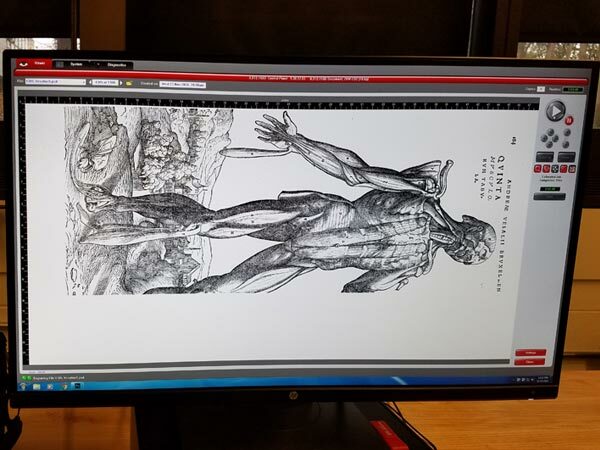 Photos of the desired images were taken using a camera and were then altered in Photoshop to a format which the laser cutter would understand. The Photoshop file was then sent to the machine's computer, and the wood was placed within the machine allowing the engraving to begin. The images were laser engraved on 1/4" thick 2'x4' birch panels (on display in this exhibit) using the largest laser cutting machine in the Digital Fabrication Studio at the Penny W. Stamps School of Art and Design, located on the north campus of the University of Michigan, Ann Arbor. 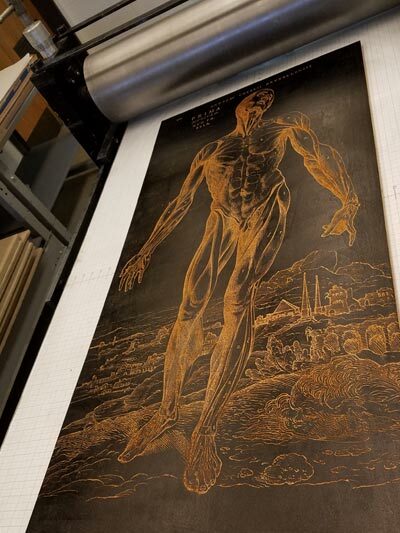 Each image took approximately three hours for the laser machine to engrave at such a scale. 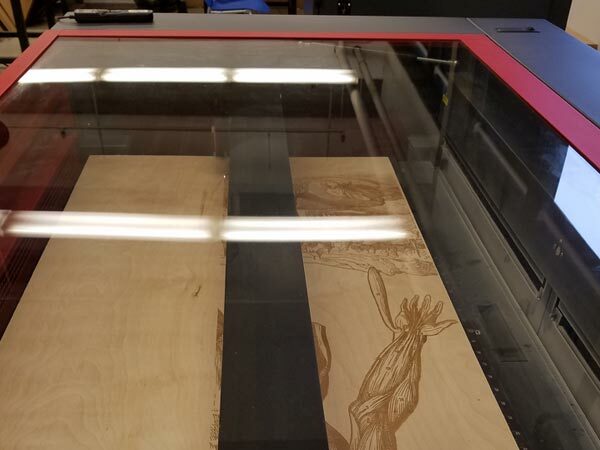 As shown in the video, the laser runs back and forth along a bar and across the wood as it burns the image onto the surface, essentially removing certain areas that are not to print (i.e., the negative space of the image where the paper shows). 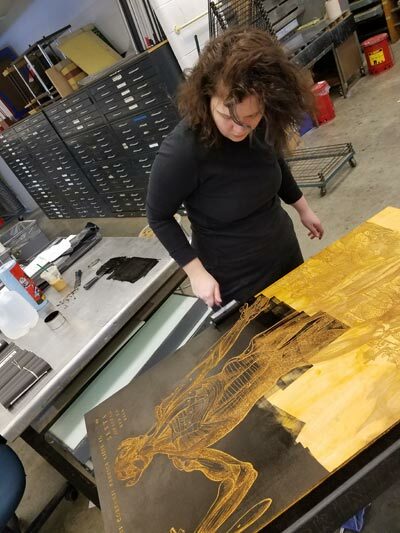 First, the woodblocks are shellacked and sanded to strengthen the surface of the wood, ensure a smooth inking/printing surface, and make cleaning the ink off the block easier. This process takes about an hour. Next the paper is prepared, cut or torn to size. 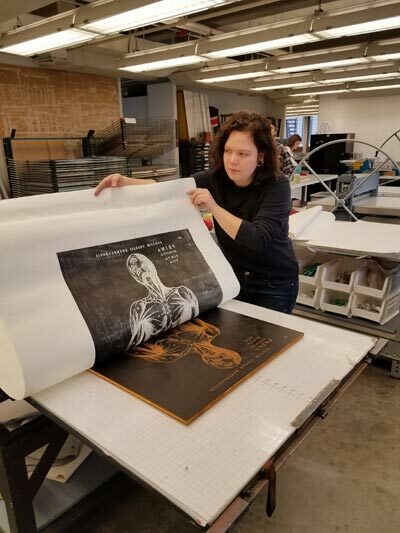 Then the block is rolled with ink by hand (as pictured) and is placed on the press bed to be covered by paper, usually newsprint so as not to waste expensive paper, and is run through the press, using a hand crank, in order to pull what is called a "proof". A proof determines whether the block will print exactly as one wishes and if the image is as the printer desires. If not, alterations to the block can be made at this time, and then the printer would pull more proofs until they are happy with the outcome. At that point, the printer would pull a print on the good paper and this print is called the ATP (approval to print) or the BAT (bon à tirer) meaning good to pull. Only a certain number of each woodblock is printed and the group of each is called an "edition". The prints featured on the wall in this exhibit are all editions of 1. Each print is black oil based relief ink on Asuka paper.